It’s fascinating that so many years after both women’s deaths we’re still learning about and discussing their dynamic. Of course we know that we owe the success and craft of the Little House Series in part (possibly in large part) to Rose. But why does she have to be so difficult to like? The Twitter universe, including Allison Arngrim, Nellie Oleson on the TV series, has commented on the potentially salacious details Rose cut from By the Shores of Silver Lake, including the time 12-year-old Laura pulled a knife on Cousin Charley when he tried to kiss her and when Pa told the girls not to watch the railroad men work because they were potential rapists. It seems that Rose was very likely overblowing these events in her letter. There inclusion in the letter should indicate their importance to the story, but Rose took every opportunity to prod her mother. As we see when she explained (as if to a child) that sexual degenerates didn’t exist on the frontier (but of course psychotic murderers did). And that her mother had misunderstood Charley. His attempt at kissing her was completely different than the time dumb old Mrs. Boast almost got her raped. Even though she didn’t know what sexual assault was at the time. One thing that still fascinates me is the discord between how Rose saw herself (always precocious) and her seeming lack of maturity when speaking to her mother. I wonder how many of us would come across the same way if our 76-year-old letter to our moms were to be dug up and mass distributed. Further, I find her lack of understanding of human nature interesting. But far more interesting (and keeping with her character) is her lack of awareness of such a shortcoming. Years of poverty didn’t make her wiser–just bitter. My final interview with a Laura Ingalls Wilder expert features Wendy McClure, author of The Wilder Life. She’s definitely an expert. I hope you enjoy it. Tell me about your first experience with the Little House books. How did you discover or learn about them? Did you immediately fall in love? I don’t really remember how I first read them as a kid, but my paperback copy of Big Woods appears to have been borrowed (or swiped) from a classroom library at my grade school, so maybe I came to them that way. Typically I’d read anything I could get my hands on. Then once I fell in love with the Little House books I’d get them from the public library. Oh, I love that you permanently “borrowed” the book! Did you have a favorite Little House book? If so, which one and why? Also, do you have a favorite book about Laura? My favorite as a kid was “On the Banks of Plum Creek,” because it was the first really long book in the series, so it felt truly epic, and Laura in that book was close to my age. And she has such an incredibly rich play life in that book—roaming all around the creek and the prairie. She has such an intimate knowledge of her surroundings and so much freedom to explore it, and for kids that’s really powerful. Plus the book has three Christmases in it. Three! 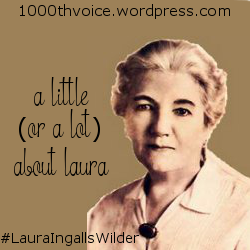 My favorite book about Laura would have to be Laura Ingalls Wilder: A Writer’s Life by Pamela Smith Hill. It’s a great biography with a special emphasis on her writing career. Since I work in children’s books (and Hill does do), it’s especially fascinating to me. I love reading about publishing history. The TV show has definitely had an influence on Laura’s legacy, but why do you think her legacy has endured as long as it has? The books hold up as really great novels. There have been plenty of children’s books written about the pioneer experience in the past century, but so many of them are hopelessly dated; few have endured as well as the Wilder books. I think it’s because in some ways the Little House books are more modern than we realize. Laura (with the help of her daughter, Rose) began writing them during the Great Depression and understood that readers would relate to the accounts of the Ingalls family braving hard times, and there have been many more times in recent history when those stories have felt relevant. The books also document a changing world—a landscape where railroad tracks and telegraph wires were beginning to appear, a way of life that was becoming less self-sufficient and more dependent on consumer goods shipped by train. Again, it’s a narrative that we all know well. Our current generation has been especially inspired by all the hands-on practices that are described in the book—making butter and cheese, butchering a pig—which are of interest these days as we start to rethink the industrialization of our food. Perhaps that’s a passing trend, but I think the books are always going to make us think about our relationships to tradition and modernity. You make a great point about rethinking the industrialization of our food with urban farming, farmers’ markets and sustainable practices being so big. In your book you wrote about churning butter and making bread. Are you still doing any of that? Did you learn anything valuable from that process? Not really with the butter… there’d be no sense in churning my own unless I had my own cow! But I make my own jam and pickles and can them, and I try to shop at farmer’s markets and the smaller, mom-and-pop produce supermarkets in Chicago instead of the chain stores. The canning stuff is really just a hobby, and I’ve learned to appreciate that I don’t have to do it, and that I have other choices. And choosing local food is important to me, and I feel lucky that I can do it. There’s an urban farm right not far from my house and they set up a farm stand sometimes. I’m hoping this fall I can get a green pumpkin there and make Ma’s mock apple pie from The Long Winter. I made one a couple years ago, and getting a farmer’s market vendor to bring you a green pumpkin can be tricky! It makes sense that you wouldn’t continue making your own butter. Didn’t you conclude in your book that it was no better than store bought? In your book, you wrote about Rose Wilder Lane and her controversial role with her mother’s books and her parents in general. Since the book was published, has your opinion of Rose changed? Can you share a few of your thoughts on Lane and her role in the books? Re: the butter—since the cream was from the supermarket, the butter tasted the same as any other butter from a large commercial dairy. I continue to be fascinated with Rose, and that feeling has only grown. She lived a remarkable life, and it’s sort of a shame that her writing is read today only for two reasons—her politics (which don’t interest me) and for clues about her possible authorship of the Little House books. Rose helped her mother a lot with the novels—there’s really no mystery there, since there’s plenty of evidence in the letters they wrote to each other. It’s clear Laura couldn’t have written the books—as we know and love them—on her own… but I don’t think Rose could have written them on her own either. When it comes to the question of “who is the author,” I don’t feel like I have much invested in either side of the debate, but from a writer’s standpoint the discussion will always intrigue me. For the most part I still think of Laura as the author, since the experiences are hers, and she was the first one to see the story in them. But… if we’re going to consider the Little House books as partly Rose’s work—and perhaps we should—then we need to recognize that they’re some of her very best and most enduring work. In all this debate I don’t feel like there’s been enough discussion about why it turned out that way. I think about how throughout her career, Rose wrote either to pay the bills or to express very big, very ambitious ideas—except when she worked on her mothers’ books. And I can’t help but wonder if that allowed her a certain kind of freedom—if it distilled her craft, allowed her to be grounded and personal in a way she’d never allow herself to be when she was working as Rose Wilder Lane. We know some of her politics made it into the books; what else of her is in there as well? I find the debate about Rose just as interesting as I find her, which is to say I’m greatly interested by it. The discussions and writings about Rose have been one of my favorite parts about rediscovering Laura. I think that most people setting out to rediscover Laura either find Rose interesting or infuriating, but they have feelings about her one way or another. A couple things: First, in late 2011 I visited the Hoover Library in West Branch, Iowa, where Laura’s and Rose’s papers are archived, and I got to see some of their editorial correspondence and the orange notebook that Laura used to write the first draft of The First Four Years. That was as amazing as you can imagine. Then last fall I went back to De Smet for a day. I was in Sioux Falls for the South Dakota book festival and rented a car, because it’s not often that I’m just a couple hours drive from the Little Town on the Prairie, you know? It was early fall, so the colors in the fields were different from the way they were in the summer, and I loved being there when it wasn’t tourist season. It was a Sunday, and the Memorial Society was closed, but Ingalls Homestead was open for one of their last weekends of the season. I was one of only a handful of visitors that day. I got to sit in the replica shanty all by myself, and wander around, and just take in everything again. (I also had a good breakfast at the Oxbow Restaurant, so I’m glad I gave them another try.) I had no expectations this time, I just went with my impulses and drove and walked around the town and the homestead land at random. Highly recommended! I still have to go back to Mansfield, Independence, and the Farmer Boy house in New York with my husband, because he hasn’t seen those places yet. And then I can’t wait for Pioneer Girl to be finally published, which it will be later this year, I think. I’ve moved on to other writing projects now (a middle-grade novel series about orphan train kids called Wanderville) but I don’t think I’ll ever be done doing and reading Little House stuff. Have you had this experience with any books from childhood? As you could tell from my reflections on Laura’s Little House books, this has definitely been the case for me. And, it’s been the case in general for books from my childhood. I got a little thrill reading that statement in Wendy McClure’s memoir The Wilder Life. It’s a nod to the shared experience of reading the Little House books, a statement about the community. As an adult McClure rediscovered her copies of the Little House series and ventured back into Laura world to reconnect with her youth. Throughout her journey she reread all the the Little House books, plenty of books about Laura and traveled to all of the Laura Ingalls Wilder sites, including Almanzo’s childhood home in Malone, NY. This was a fun, enjoyable book. I immediately felt connected to McClure as if, in the words of Anne Shirley, we were kindred spirits. I bet any fan of Laura would feel the same. I highly recommend this book for anyone who enjoyed reading the Little House books as a kid. Check it out! Have you read McClure’s book? Make sure you come back on Friday to read my interview with McClure! One thing that stood out to me was how wise Laura was and how capable she was as a writer sharing her wisdom through stories. Laura was also humble about this (and her success in general). When asked about her success, Laura said, “I was amazed because I didn’t know how to write.” Ahh, our humble, loveable Laura was really humble in real life. This makes me unspeakably happy! One of the columns in the book is an account of the building and finishing of Laura’s dream house at Rocky Ridge Farm. What captivated me about this was her attention to detail and how contemporary she seemed. Laura’s writing is always clear and forthright, but her article is contemporary for a reason beyond that–in today’s world of shelter blogs, it’s interesting to see that Laura was as thoughtful about the details as many men and women are today. Again, Laura sounds relatively modern in her column about how farm wives can make extra cash by hosting summer boarders in their homes. That’s not the part that sounds modern; in fact, the entire concept of boarders is outdated. But she spoke of how visitors from the city would pay well for the breath of fresh air and fresh food from the farm, not dishes and ingredients brought from the city. My mind immediately went to things like farm-to-table restaurants, backyard square foot gardens, farmers’ markets and more. Overall, this was a great, well-edited collection. William definitely knows Laura and understands her in a way that most people don’t. He connected the various phases of Laura’s pre-Little House writing life with well-researched and well-reasoned commentary on Laura’s life and motives. I would highly recommend this book to any Laura lovers. This book is interesting for a few reasons. It’s a categorical account of the Wilder’s trip from De Smet, SD to Mansfield, MO, including the cost for various work tasks and the number of wagons traveling both ways down the trail. Now, I know that sounds kind of boring and a lot of people think it is. But I found it really fascinating. It’s chock full of information that historians and history nerds find fascinating about that time. As a farm wife, the cost of labor and its products were fascinating to Laura. The fact that it fascinated her, fascinated me as well. It’s also interesting reading Rose’s thoughts. Published after Laura’s death, Rose wrote the introduction and the postscript – an eye-opening read for anyone in love with Laura, especially a young kid, to happen across. Rose is simultaneously generous and vitriolic toward her parents. The vitriole is, of course, difficult to read. After reading eight books and reconnecting with Laura, I don’t want to read any negative thoughts about her. Also, throughout those eight books, Laura was very clear about her own shortcomings. I definitely didn’t want to read someone else’s negative thoughts about her. Rose used her position to point out how perfect and precocious she was. There’s the photo of her as a two year old, which she clearly recalls posing for. Then she states that she was far too advanced for De Smet elementary (even as a second grader). Anyone, particularly Laura, insinuating that she wasn’t perfect or simply reminding her of the rules as any attentive parent would, was subject to her indignation. This fact is evidenced in the events that happened when the family arrived in Mansfield. The down payment money they’d saved for months was missing. Laura and Almanzo were frantic. Laura asked Rose several times if she’d touched the money, showed it to anyone or told anyone about it. Rose was adamant that she hadn’t and so mad at the implication that as an adult she was still traumatized by the incident. It’s understandable that she’d be upset about this as a child, but to be upset enough to remember it into adulthood with such bitterness is just bizarre. Again, I will state that this book shouldn’t be shelved as children’s lit. It’s far too dry and confusing. But as a look back at the time for an adult, it was definitely fascinating. Well, this brings me to the last of the solely Laura-written books. I’ll wrap up next week with reviews of William Anderson’s The Little House Reader and Wendy McClure’s The Wilder Life; both of these books provided a more detailed look at Laura’s adult writing life (the former) and one woman’s journey to rediscovering her childhood love of Laura world (can you see a parallel here?). Have you read On the Way Home? How do you feel about Rose’s bitterness about childhood slights?